Governor Mike Pence tried to sell his tax cut idea to a group of mayors today and got a chilly reception. 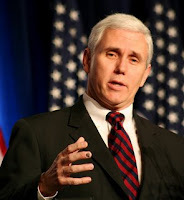 Pence spoke to a meeting of the Indiana Association of Cities and Towns inside the Statehouse. Pence began his political career as a talk show host advocating conservative principles. When he went to Congress, he continued to champion fiscal and social conservative views. In those two political arenas, political philosophy mattered a great deal. As Governor, Pence finds himself facing an entirely new political landscape. While most of the mayors at today's event are Republican, Pence found that they had little interest in his fiscally conservative message of cutting taxes and spending. I can't say that I'm surprised. One thing Governor Pence may learn if he hasn't already is that an entire constituency for taxpayer money has developed over the past few decades in local government. You have the profiteers - developers, contractors, architects, law firms and others who have become wealthy feeding at the local taxpayer trough. Municipal politicians have a symbiotic relationship with these profiteers that involve advocating for more spending in exchange for more campaign contributions, which money of course originates with taxpayers. It's a vicious cycle. The Republican mayors who advocate for more taxes and more spending are only able to do so because the local political system is isolated from being competitive battles based on political philosophy. In so many localities, there is no philosophical difference between the major parties' candidates. No better example of that exists than Indianapolis where Republicans have actually led the push for increasing taxes and spending. Pence would make a mistake to think that those fiscally-liberal mayors actually reflect the wishes of Hoosiers. Those mayors' constituents are the profiteers in their communities. Governor Pence's constituents have to be the taxpayers who continue to be victims of the ever increasing state and local tax increases. Governor Pence began his politcal career with a failed run for Congress. Not too long afterwards, he picked up that talk show gig. The party of small government has become a figment of its dis-conservative taxation. Failure Varan, is what many consider as mere pebbles on the path toward what they consider to be success. I'd say so, Pete. About 95% of people who run for Congress against an incumbent (as Pence did) lose. No shame in that. Perhaps Varan was just clarifying my timeline. Readers interested in an insider's critique of the Indiana Chamber are referred to the fall issue of The Indiana Policy Review at www.inpolicy.org or write the editor at director@inpolicy.org to receive a digital copy. Could be that folks are hunkered down & scrapping to survive in a 5% or 8% or maybe 15%+ unemployment economy and busy trying to keep up with escalating taking by these hacks. Paul is correct. I was simply clarifying. Just as discretional spending has been greater under Republican presidents in the past 50 years, I'll bet that state spending has been greater under Republican governors. There is no more risible oxymoron in American politics than "small government Republican."